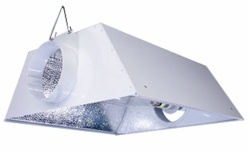 The least expensive way of reducing the heat in the grow room is to vent out the heat and replace it with cooler air. Sounds simple right? Well it is, but what most beginners forget is that you can't blow the hot air out without a way for the cool air to get in to replace it. 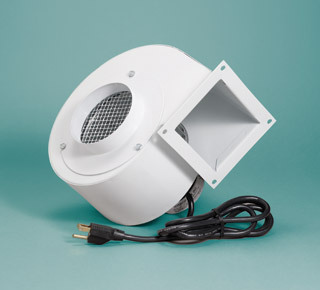 The best way to setup a venting system like this is to mount one exhaust blower on the inside of the grow room up high to blow the heat out, and another blower on the outside mounted down low blowing cool air in. Hot air rises, cool air settles. Exhaust blowers are rated or sized in Cubic Feet per Minute (CFM) of air, like "265 CFM". This is the amount of air the blower will move in one minute without any restrictions on the intake or exhaust. If a blower is rated at 265 CFM but it's connected to a 25 foot long tube like a dryer hose, it's not going to move 265 CFM because of the resistance in the hose. Aluminum tubing with smooth inside walls creates less resistance and the blower runs more efficient. So what size blower should you get? Well it just depends on how fast you need to exchange the air. If your grow room is 6 feet wide, 6 feet long and has an 8 foot ceiling you have 288 cubic feet of air in the room (6x6x8=288). So if your blower is rated at 265 CFM, and it has no restrictions on the intake or exhaust side, it should take about a minute to replace all the air. Of course if the air your replacing it with is already hot, it doesn't do much too cool the grow room. So it's best to draw cool air from outside. The exhaust blower can be turned on with a thermostat so it only runs if the temperature gets too high. The thermostats plug into the wall and have an outlet for the blower. When you set the temperature at, let's say 80 degrees, the blower will turn on at 80 degrees. It will stay on until the temperature drops to 80 minus the differential. The differential is the difference between the turn on point and the turn off point. It's usually about 4 degrees. This means that if the thermostat is set at 80, the blower will turn on at 80 degrees and turn off at 76 degrees. This gives the blower some working time. If the thermostat had no differential the blower would turn off as soon as it turns on, then off, then on, etc., not very efficient. Some people turn the blowers on with a timer. The blower might be set to turn on at a specific time or multiple times during the day. This will also get the job done, but it's not the most efficient method. If you're looking to control the temperature you should measure the temperature, not the time of day. Sometimes the air coming in is just too hot and can't cool the room. 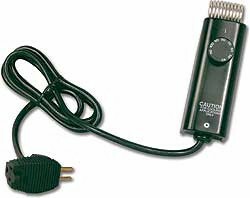 When this is the case the blower can be run on the same timer as the grow light, or another timer set to go on at the same time. This is not really solving the problem, just a cheap fix. The problem is the air coming in is too hot, so why not cool it. An air conditioner can be used for the supply air and a blower can blow out the heat. An alternative to moving all the air out is to capture the heated air and vent it. This can be done with an air cooled grow light. The advantage with this setup is that you're using less energy to move the heat out. The volume of air in the reflector might be 3 cubic feet and you can vent it out in a few seconds. It doesn't matter if it's hotter, just how much of it you have to move. Venting a 288 cubic foot grow room that's 95 degrees takes a lot longer than venting a 3 cubic foot reflector that's 150 degrees. Another advantage with an air cooled system is when you're using a CO2 system too. The CO2 doesn't get blown out when the blowers turn on. The air in the air cooled system is a separate environment from the grow room. Your CO2 cost will be lower since it's not being wasted.